Combination of magnification and field of view. 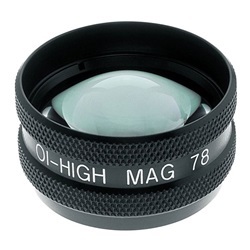 Lens is black with a static field of view of 84 degrees and dynamic field of view of 139 degrees. Image magnification of 0.93x, a laser spot of 1.07x, clear aperture of 29mm and a working distance of 8mm. Weighs 17g. Manufactured by Ocular.